Vice President Joe Biden’s cancer “moonshot” has been very much in the news since it was made widely public in President Barack Obama’s State of the Union speech earlier this month. Most commentary has been positive – who does not want more money to go for cancer research? Apparently, the National Cancer Institute’s budget will be increased by $260.5 million to a total of $5.21 billion in the recently approved fiscal 2016 budget. The broad concept is great. Bringing Americans together in the early 60s to support the US space mission – a seemingly impossible goal – worked incredibly well! But this was a single, targeted goal. A cancer moonshot is much more complex and will require not only substantial funding but bringing many teams together with a common goal. This is much more difficult. If the cancer moonshot is to succeed, says Vice President Biden, scientists must establish strong research collaborations and break down “isolated silos” of research. The IMF has already made this happen as part of our Black Swan Research Initiative®. The Black Swan approach to curing myeloma emerged from brainstorming efforts in 2012. As was needed for the space mission, the key step was to establish the primary goal. Rather than landing on the moon, the goal is to achieve zero minimal residual disease (MRD) after myeloma therapy. Expressed in these terms, the steps necessary fell into place. The first need was to be able to precisely measure minimal residual disease at low levels. Just as it was necessary to figure out how to use a booster rocket to leave Earth’s gravity and identify a landing place before building the moon lander; we needed to develop and standardize MRD testing at the < 1 in a million cell level to be able to monitor therapy. The next step was to develop novel combinations to achieve a sustained MRD negative status. Each aspect and each step in the Black Swan Research Initiative has required a different focus and expertise. Managing such a project is like conducting an orchestra; you need individual experts working together in harmony. Within BSRI, there are now over 20 projects with the ultimate goal of achieving a sustained MRD-negative status for the maximum number of myeloma patients! As new treatment combinations are being developed, new research is required to understand the biology of the MRD-positive resistant subclones. Evaluating the immune therapies, such as monoclonal antibodies, is an exciting opportunity. The National Immunotherapy Coalition, which Andrew Pollack wrote about in the New York Times on Jan. 11th, will try to rapidly test various combinations of immune therapies. The driving force behind this new coalition is Dr. Patrick Soon-Shiong, a Los Angeles-based billionaire who has brought together Celgene, Amgen, and some smaller companies to collaborate in this effort. Although Mr. Biden has met with Dr. Soon-Shiong to discuss the cancer moonshot, the details of the program are as yet unclear. Since there have been several “War on Cancer” programs over the years, there is a degree of skepticism about the potential success of this newest national initiative. A recent letter to the editor of The New England Journal of Medicine exemplifies the types of problems to be anticipated and overcome in the latest war on cancer. Anti-CD19 chimeric antigen receptor transduced CTLO19 cells (“CAR T cells”) were used to successfully treat a myeloma patient. But the patient’s myeloma cells were 99.5% CD19 negative (not positive). Why did the treatment work? The researchers from University Hospital in Cologne suggest that depleting CD19-positive memory B cells produced the dramatic benefit. Such B cells can promote growth of CD17 negative myeloma. Thus, eliminating promoter B cells is helpful. A kaleidoscopic pattern of interacting immune and other cells regulating myeloma growth is thus emerging. In another recent New York Times article, several experts debated important additional aspects of a “cancer moonshot” which are also already part of BSRI: early detection and prevention; molecular testing; patient data analyses (“big data” research), and empowerment of the treating clinician. From the perspective of global health care, prevention and early detection deserve a much more elevated priority. Preventing illness is the cost-effective route to balancing or stabilizing healthcare costs, not to mention avoiding the devastating impact of developing cancer. An exciting new BSRI-funded project is starting in Iceland, where patients will be screened at age 40 for MGUS (monoclonal gammopathy of undetermined significance) with the goal of early diagnosis and treatment: actually preventing patients from ever developing myeloma! Thus, multiple strategies can lead us to multiple areas of success. As we know from such recent films as “The Martian” and “Gravity,” space missions can run into trouble and backup plans are required. That’s why we structured the BSRI to include both redundancy (i.e. multiple efforts to find best solutions) and contingency plans for better or alternate therapies to achieve sustained MRD negativity. All of this is going to cost a lot of money. Thus, although we have enjoyed great success in funding our initial projects, much more funding is needed and is being sought! So, a myeloma moonshot it is! We are off and running. We have lift-off and are hoping that as we move in for a landing, it will become more and more clear that curing myeloma is and was indeed a very tangible goal within our reach. Submitted by Susie Novis Durie on Tue, 02/02/2016 - 06:04. 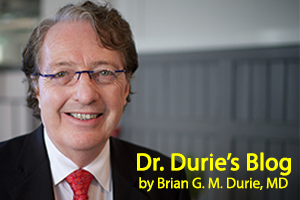 I hope that people will take the time to read Dr. Durie's blog on the Moonshot, and re-post it on Facebook. This is a very exciting time and what he's proposing for myeloma can be applicable for other diseases as well. Collaboration and a great idea can change the world! Submitted by Amir on Thu, 09/15/2016 - 01:38. Hello Susie, the only light in my trip of fighting with MM during last 3 years is just a comment on MM magazine from your self as " the MM cure is within reach" as well as the hopes getting from my specialists, but also whenever I repeat this to myself or to my specialist, there is question mark in my mind how close we are. believe me that your comments as well as Dr. Durie's blogs always give me lots of hope to fight this Monster. i appreciate all efforts you and your colleagues doing day by day to get in the cure. you are great and light of my family life including my wife and two little kids.